Announced in July 2000, the PowerMac G4 (Gigabit Ethernet) added dual-processor power to the G4 line. 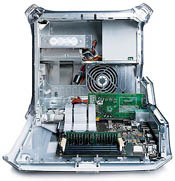 Available with a single 400 MHz G4, or dual 450 or 500 MHz G4s, The new PowerMac G4 also included onboard 1000Base-T Ethernet as standard equipment, an industry first. The PowerMac G4 (GE) shipped in three configurations: The single-processor 400 MHz configuration included 64 MB of RAM and 20 GB hard drive, for $1599. 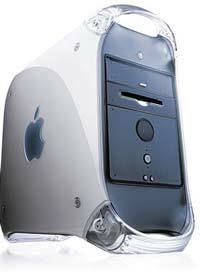 The dual-processor 450 MHz configuration included 128 MB of RAM and a 30 GB hard drive for $2499. Finally, the dual-processor 500 MHz configuration included 256 MB of RAM, a 40 GB hard drive, and a DVD-RAM drive, for $3499. All configurations included a 56 kbps modem, Apple's Pro Mouse, and the innovative new Apple Display Connector (ADC) which passed video, power, and USB to new Apple Monitors from a single connection.